Welcome to new readers and box customers. Your regular news from the market garden – what’s coming up in your veg box this month, industry news, recipes and more. We love to feature customer recipes or your foodie news/blog – your own or interesting ones you’ve found. Send us your links! New visitor? Subscribe to receive this bi-monthly mailing. Celeriac, squash, leeks, fennel, beetroot giving the boxes an autumnal feel, we’ve got the last of the peppers from the polytunnels coming out in the next 2 weeks. We’re bringing in carrots from the Borders and trialling potatoes direct from grower Romeo at Peepout Organics in Pembroke (we’re much better off leaving these big crops to farmers with big machines!). Romeo is also supplying some lettuce to enable us to get the right mix in our salad bags – newly out again – as our current leaves are quite spicy. The brassica’s are looking promising – big round savoy cabbages hearting up, and sprouts getting fat for Christmas. Elsewhere we’ve got chard, kale, celery and nice herbs – flat leaf parsley, coriander and Welsh onions (like chives). You can now fully customise your order with a My Choice box (min £11 value for home delivery). Don’t forget to revisit your account to update substitutions and exclusions. Changes to your order – pausing, substitutions, extras can be made through our ordering system Bucky Box – by the Friday before your box is due. Log into your Bucky Box account and take a look. To make changes click on the ‘my order’ button. If you want to order a veg box visit our webstore. 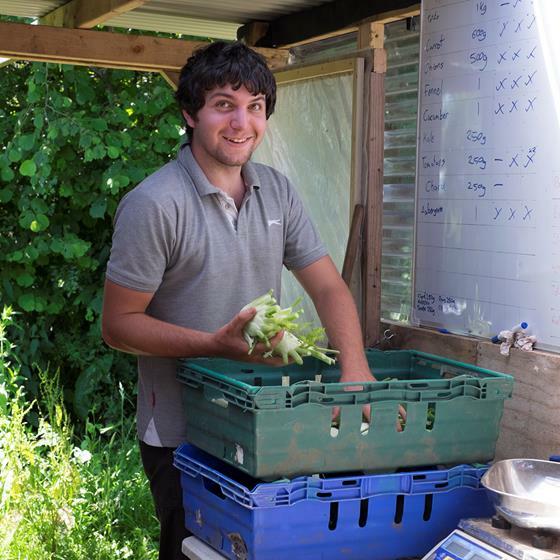 We’re experimenting with vegbags from the Soil Association in place of economy boxes – keeping veg dry on damp delivery days and saving us a few pennies – would appreciate some customer feedback, and please leave your boxes out for Chris to pick up on a dry day – thanks! We were pleased to giveaway to customers the green tomatoes from the end of this year’s crop. Here made into chutney by shareholder Clare – thanks for sending in the picture, and glad they found a good home! All Change at the Market Garden! Its been a very difficult summer for us as our head grower Keir left to set up his own business at the end of June. Replacing him proved challenging – not many horticultural growers out there, and the remaining market garden staff have been under a good deal of pressure trying to keep things going – at the most demanding time of year. We’ve had some great temporary staff – Ceri and Jane – and our previous grower Sophie came back to do some mentoring. Assistant Grower Tom has done a fantastic job stepping up to the plate to keep things going, learnt how to drive the tractor and used it cultivate the field. 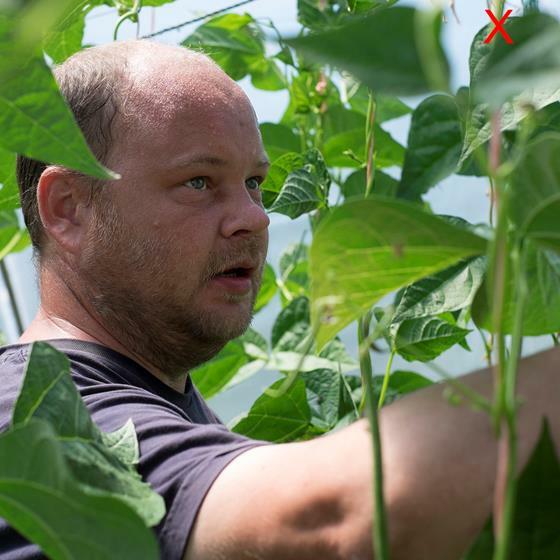 We’ve now struck lucky and found a new grower Scott who has been market gardening for many years in the Brighton area to start at the end of October. As we are also out of our grant funded period Scott will also be setting to to see that Riverside Market Garden can stand on its own two feet financially. What’s Going on at the Field this month? Polytunnels cleared now of tomatoes and cucumbers and beds readied for salad plugs to be planted out end October. We’ll have a plentiful supply of salad bags in the New Year to keep some tasty greenery in the boxes during the winter. We’ve got some green manure down on the empty sections of the field and the warm weather has got that off to a good start. The squash were harvested last week – having made the most of the indian summer. After a rest period they’ll be in the boxes in time for Halloween – definitely not for making lanterns with though!!! Out with the cucumbers, preparing for winter salads. We’ve been pleased to get more closely connected to the village of St Hilary – where we are based in the Vale of Glamorgan – and are now going to open up for gate sales to passers by. We regularly attend Cowbridge Farmers Market – first and third Saturdays in the month, and the lovelyCowbridge Country (ex WI) Market first and third Friday morning’s in the month. We’ve been unable to regularly attend Riverside Market because of staffing difficulties. This bi monthly mailing is going to our shareholders, customers, staff and other interested parties. Please opt-out if you’d rather not receive it. If you have any feedback on your experience as a Riverside customer that will help us improve what we do we’d love to hear from you. If you’d like to share this mailing with friends/family/colleagues we’d like that too! We are seeking to expand our Board of Directors. If you would like to be more closely involved in the life of Riverside Market Garden please get in touch. Riverside Market Garden becomes Coed Organic Ltd! Open Day this Sunday 16th July 11-2pm. Fab lunch on offer!